a speciality of kerala and the down south of tamilnadu....this is a breakfast item which keeps variating with one or two ingredients less or more...well this is the way i make it.serve it with stew or just enjoy it with coconut milk and sugar!! soak rice at least for 5 hours adding urud dal and methi seeds into it. grind along with grated coconut and cooked rice into a smooth batter. dissolve yeast in few spoons of water and add to the batter and set aside over night for fermenting. Just before cooking it,add baking soda,sugar and the coconut milk and make the batter to pouring consistency. 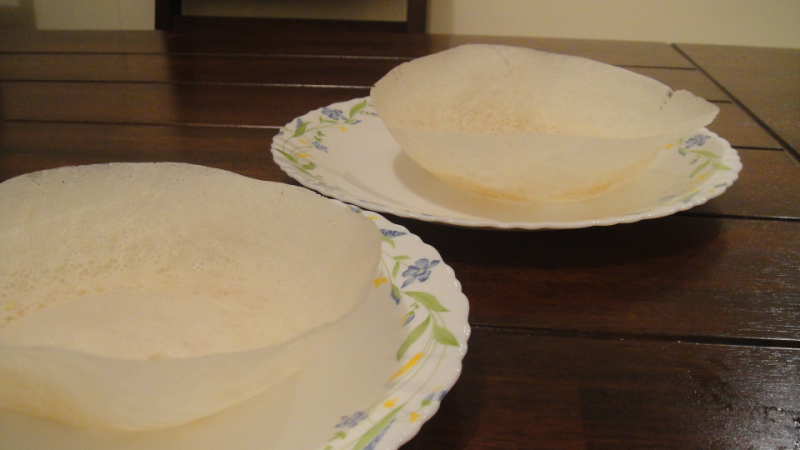 pour into the appam kadai and tilt to all sides and cover with lid to cook at the center and the sides. serve immediately as they are tasty when served hot and crisp.